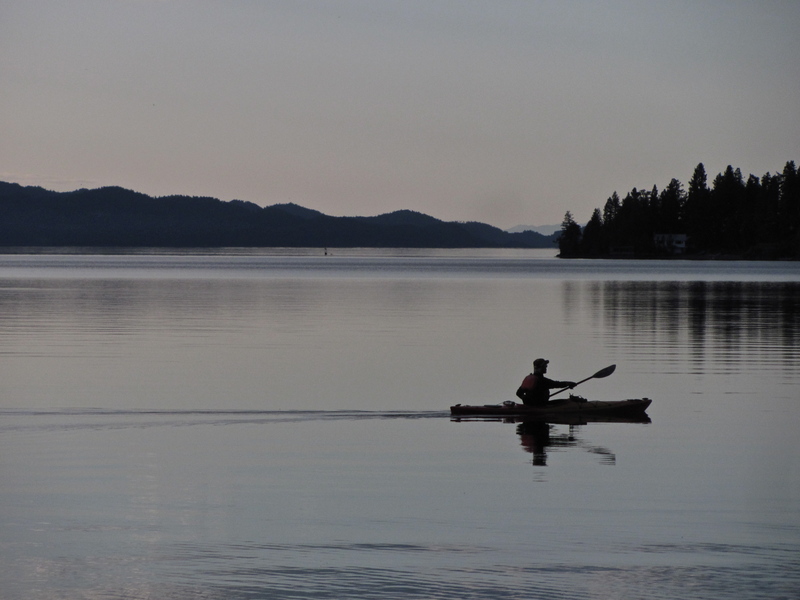 Paddling around and through The Narrows on Flathead Lake offers the paddler a wide range of possibilities and variations. One island leads to another; intense sunlight gives way to shade, and shade to a blast of light; deep open water ends suddenly in a sparkling ramp of stones or a reef. 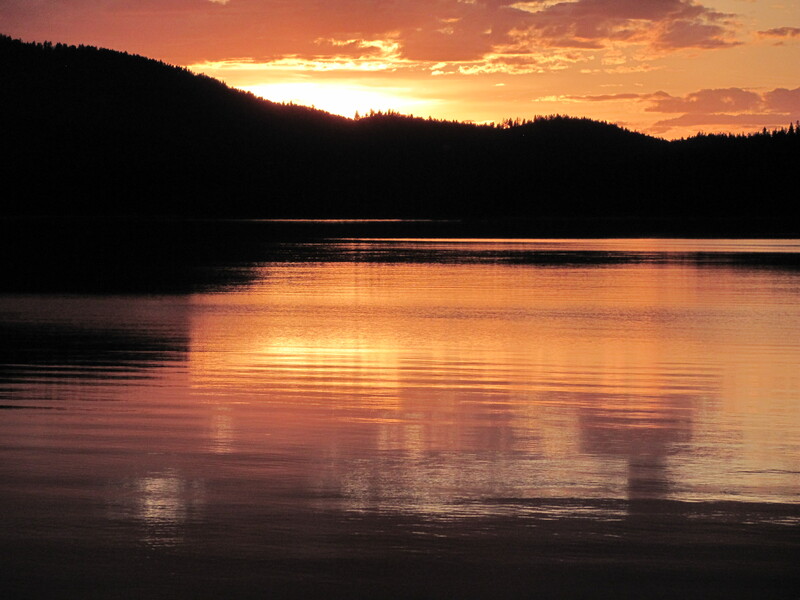 This is simply a great place to paddle. After driving north from town on a hot day in July, I can hardly wait to get my boat in the water. I make myself wait through the process of setting up camp, erecting the tent and an alcove for shade around the picnic table. I fill the big blue jug and placed it on the bench at a slight angle so that water will flow through the spout with a little pressure. I make myself wait for friends who are delayed in town but who plan to rendezvous with us. When everything is finally in order and friends found their way to the spot we reserved for them I slip Bluebird in the water and begin to paddle toward the unnamed island just to the northeast of Bull Island. I can easily complete this four-mile paddle before dinner. In years past a pair of bald eagles raised their seasonal broods in a big nest on the south side of the island. I want to see if the nest is active this year. My attention is soon drawn to the conditions, however. As high pressure builds in the region, a strong wind blows out of the north. Whitecaps begin to form in the open water between the state park at Finley Point and the island. The wind and waves give me the resistance I need after containing my energies in camp: I need to paddle against something. At last I can express my own energy openly and fully. In the distance I can see the smooth water of the island’s lee, the body of the island and tall pines blocking most of the wind. I slip into the quiet and catch my breath. Even here, though, I can hear the wind on the other side of the island and the waves crashing on the north-facing shore. I begin to paddle cautiously along the west side of the island. I feel safe enough paddling directly into the force of the wind and waves. I pull a few yards past the north shore of the island and feel daunted by the big dark waves that break against the ramp of rock leading to the body of the island. I know that turning my boat sideways to these forces could easily result in a spill. If this were to happen, my boat and I would be thrown against the rocks on shore. While holding my position straight into the wind and waves I consider a couple of options: I can back away into the relative calm water of the west shore and return the way I came, or I can wait for the best possible interval between waves, paddle hard through the opening, and begin the process of rounding the small island’s north side. Trying to make a good decision, I wait in the rolling waves. I simply hold my position and observe the waves. I watch them roll down the fetch of the lake, see how their dark bodies rise and tip over in a white noise of air-saturated foam. In time I begin to get a feel for the rhythm of the waves. When I seem to have the pattern in mind and my energy in hand I wait for one wave to break, accelerate into the opening before the next wave, make several very hard strokes and initiate a turn just as the second wave breaks on my port quarter. I brace hard on my right to keep from being rolled like a log, then accelerate again to build a little distance between the next wave and my boat. In a few seconds I am past the north side of the island and heading for camp. Though I have completed the turn I need to keep my focus. The waves keep breaking on my stern quarter and require a quick brace in response. From time to time I try to paddle fast enough to catch a wave, riding the interval between the approaching wave and the receding one. When one wave passes under me I pause so as to not use up my energy paddling up the backs of waves. In a few minutes I am well on my way back to camp and the feast that awaits us as we gather at the picnic table of campsite #2. 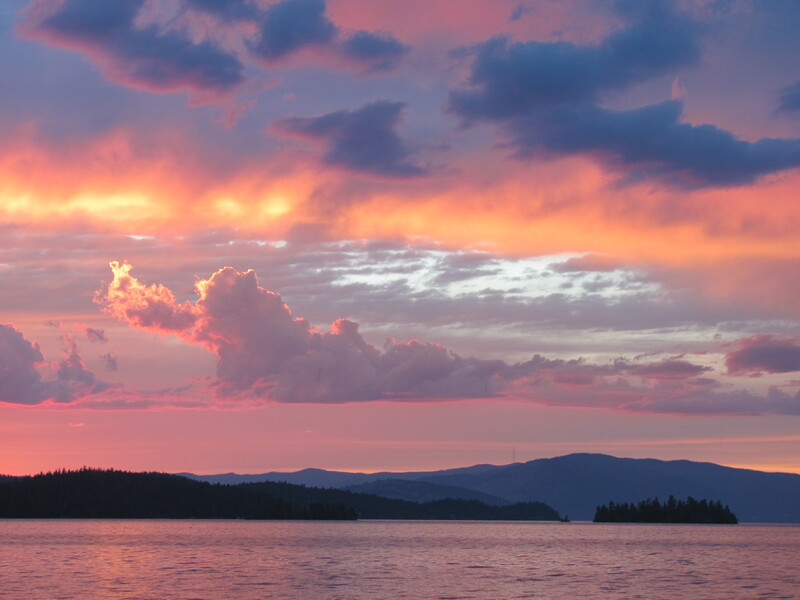 I have often paddled in what I consider the safe range of waves that flow across Flathead Lake (1-2 feet). I have occasionally felt frightened, less by the general train of waves and more by the odd, idiosyncratic wave that seems bigger than the rest. This short paddle, one I have done many times, taught me something new. When I felt frightened by what I saw on the north side of the island—the full expression of the length of the lake’s power, I realized that I did not need to force my way into the tumbling waves. I did not need to maintain the pace that took me to the island. I could hold my position, wait, observe, consider options, and then decide. I could watch long enough to sense the subtle variations in the rhythm of the waves and advance into the best opening possible. I could trust my ability to accelerate, trust my body to adjust to the wave’s tendency to bring me parallel rather than perpendicular to its energies. I could wait for fear to pass and the wisdom of experience and confidence to flow back into my body. Having learned to wait, I made a safe passage around the island’s north shore and coasted back to safety and friends.